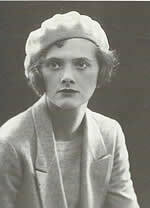 Daphne du Maurier (13th May 1907 - 19th April 1989) was first and foremost a really excellent storyteller but she was also part of the remarkable du Maurier dynasty - a granddaughter, daughter, sister, military wife, mother and grandmother. Daphne is often thought of as reclusive; she was perhaps solitary, comfortable with her own company and the make-believe world that she lived in and which enabled her to bring us her wonderful novels and short stories. In this part of the website we plan to introduce you to the many aspects of Daphne du Maurier, her life and her writing. As with all areas of this website we look forward to receiving input from anyone who would like to contribute an article or a snippet of information. This will help us build a picture of who Daphne was and what she means to all of us.